It’s check-in time for our winter stitching plans, so here I go! 1. Keep up with the two bees I’m in. Okay! I’m still on time (technically): I’ve almost finished my owl block for Sew Bee Joyful, and I have five days to get my Piece Bee block done, hehe. 2. Finish Christmas presents for M, S, G, DB, JF, R, Ka, and Kr. 3. Finish Drunkards’ Path quilt. Done! 4. Make owl quilt for G. Done! 5. Make the cute fox-in-snow baby quilt from Scandinavian Stitches Done! 6. Finish Grandma P’s Full Swing quilt. Not done! I’ve moved it to the trunk of my car… so that when I’m bored at work I can schlep it on up and seam rip during my lunch. I haven’t actually done that yet, but it’s still… progress? 7. Finish my picnic blanket made out of Spoonflower fabric and other charms. In progress! I decided to use Pin & Bobbins’ Made In Cherry quiltalong for this, and I’ve got a pile of I Spy charms that I just counted up for it yesterday. I’m just a leetle behind. 8. Finish Sunshine’s quilt. Er, nope. 9. Make a wrap cardigan Hah! 10. 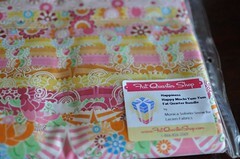 Make a quilt out of my Happy Mochi Yum Yum fq set. Nopezors. 11. Make birthday presents for D, DB, N, and C. Also G and S if winter includes March. :} Sorta done! Wait, who did I mean by “C?” Dohhhh… Anyhoo, DB’s present was the fox quilt (above), so that’s done; N’s present were these coasters and the purple zip bag, so she’s done; and I just started my dad’s present last night, so I should be able to finish it up tonight. Who is C?!? Looks like you’ve gotten lots done, just a bit more to go! Hope C doesn’t read the blog! You’ve completed more projects so far this winter than I did all last year! Great projects, and hope you figure out who this shadowy C person is very soon.